In the spring of 2013, Joyant had just completed a refit that included repowering. 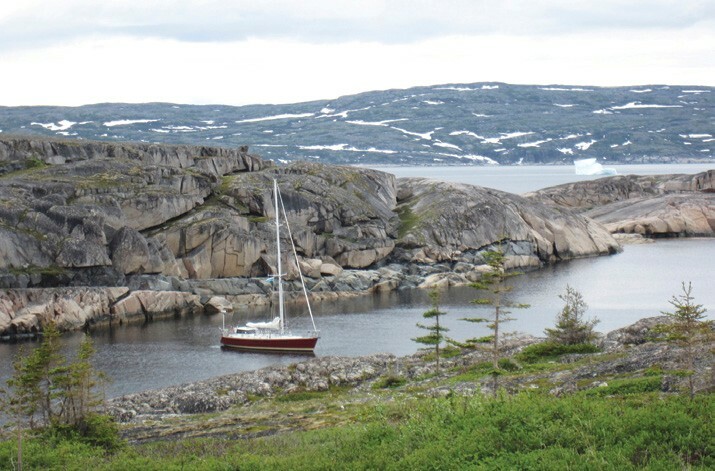 When circumnavigating Newfoundland in 2003, we had explored the southern third of Labrador and wished to see more. So, we decided for our shakedown cruise to head to Labrador and see how far north we could get. After a quick stop and shore trip at Sable Island and the check-in to Canada at Corner Brook, Newfoundland, we reached Labrador on June 29. The trip was not a short summer cruise. We ended up reaching Cape Chidley, Labrador’s northeast tip, and logging 4,100 miles on the round trip from Mystic, CT.
Southern Labrador is much like Newfoundland with pleasant small towns, boreal forests and numerous harbor choices. North of the Hamilton Inlet, the entrance to Lake Melville and Goose Bay, the population dwindles. There are just five small inhabited coastal towns, none reached by roads. The farthest north is Nain, about two-thirds of the way from the Quebec border to Cape Chidley. Beyond Nain, there are no permanent settlements. As you progress north, the coast gets more mountainous with less vegetation except for the soft, low growing tundra. Trees grow only in sheltered spots and the weather gets colder. The northern quarter of the coast is made up of the Torngat Mountains National Park and is indented by numerous fiords backed by gray craggy mountains decorated with snow streaks. In the past, Labrador charts were not correctly geo-referenced. Navigation required constantly using bearings and radar ranges to plot your location since the GPS position was off by significant fractions of a mile. This trip, we had two charting systems running when underway. Our new radar/plotter used Navionics vector charts and we had MaxSea TimeZero, which used NT vector charts, on a laptop. Both systems were on deck under the hard dodger so we could constantly compare them to each other and to radar and visual sightings. We were pleasantly surprised to find that all the way north, both sets of charts were fairly well geo-referenced, a huge improvement from our last trip to Labrador. Large areas of the coast are not surveyed or are partially surveyed, with only occasional soundings or track lines surrounded by unsurveyed areas. Even in the “fully” surveyed area, the charts are missing some rocks and sometimes the depths are remarkably far off. Having two different charting systems was useful when the errors were the result of differences in the way the two companies translated the charts into vector format. Sometimes one version was clearly better than the other. But often they both used the same raster chart as a source, so the errors on it were faithfully transcribed to both of our vector charts. Careful navigation was essential. Fortunately our only grounding was at low speed in a harbor where the chart said we should have had plenty of water. Labrador Coast Guard radio broadcasts VHF weather reports, including both a two-day, short-term forecast and long-term information extending out three more days. Nain is the northernmost station broadcasting these reports and a day north of Nain we were out of VHF range. We found that the GRIBS we downloaded from SailMail via our SSB and Pactor modem consistently agreed with the Canadian forecast. We were also able to download the Canadian reports through Saildocs, a part of Sailmail, so forecasts were always available. In northern Labrador, there was sometimes a great difference between the forecast and actual weather, most likely due to the nearby mountains. The weather during the summer of 2013 was unusual. Just north of Hamilton Inlet we were stopped by pack ice as we tried to round Cape Harrison. Finally we were able to spot a lead very close to the cliffs which enabled us to sneak safely by the point to a clearer area. A few hours later, a second encounter with thick pack ice caused us to head inland behind various sheltering islands and into a relatively ice-free area. When we reached the town of Makkovik several days later we were pleased to find plenty of room for us at the fish plant dock. The crab boats, which would normally have filled the place, were a month delayed due to the heavy pack ice. After Makkovik, there was less onshore wind bringing the pack ice in, and our route was sometimes protected by off-lying islands, so ice did not stop us. In 2013, the 200-foot high bergs we saw 10 years ago were replaced by more numerous bergs rarely over 100 feet high. Our favorite spectator sport became “berg watching.” You can find many squiggles in Joyant’s track where we diverted to photograph the beautiful and varied examples. In keeping with the generally cold weather and poor sailing conditions for much of the summer, on the morning of July 17 we awoke in Seaplane Cove to find the entire cove frozen over and Joyant iced in. The ice was thin and we could power through it, but we had not read or heard of other boats having that happen in mid-summer. We have cruised to 62 degrees north in Prince William Sound and 80 degrees north in Svalbard without having ice form in the summer, and we were only at 60 degrees in Seaplane Cove. We stopped at two of the five Inuit towns north of Hamilton Inlet. The cruising guide and people we met had warned us about bothersome children and items going missing from visiting sailboats in these towns. Our first stop was the southernmost town, Makkovik, which we liked very much. There we met one of the two local Royal Canadian Mounted Police officers for the town. He had also worked in Nain and gave us his opinion of which towns were fine to visit and which to avoid. Makkovik was the best and Nain was next to the worst on his list, but one of our shakedown problems necessitated several stops in Nain. The larger of our two new alternators had had three different failures, the third of which appeared to be fatal. In Nain, RCMP officers were again very helpful and offered to let us have a replacement shipped to their office. Even though the population of Nain is only about twice that of Makkovik, there are seven RCMP officers stationed in Nain to keep a lid on things. They recommended that we leave someone aboard the boat at the dock during the day and that we anchor out at night when the drinking starts and most of the difficulties occur. The dock in Nain is a gathering and fishing spot for the populace so we met lots of people during our daytime stays there. They were uniformly friendly and helpful. 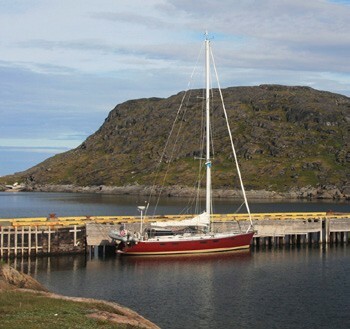 The beautiful and very sheltered Kauk Harbour is just six miles south of Nain so we spent our nights there in peace and quiet. The Inuit are excellent fishermen, and twice we were given freshly-caught arctic char by friendly people who saw us anchored in harbors near one of the towns. While waiting for the new alternator to reach us, Balmar emailed us a photo with a potential solution to our problem. Tom was able to make the repair and the alternator worked fine, so we headed north, figuring we could pick up the package on the way back. It was a good thing we didn’t wait. The new alternator never arrived and Balmar got our money back from UPS. North of Nain is polar bear territory and we were prepared. Both our “personal protection” and our sat phone always went ashore with us. Tom was lucky that we spotted a large and very lithe polar bear on his birthday – July 17. We were underway at the time and diverted to take photos as it traveled rapidly, leaping large boulders with ease, along the shore and up beside a tumbling stream. Happily, we did not see any bears while we were hiking ashore. The number of bird species declines as you head north but not the number of birds. Several times we were surprised by flocks of several hundred scoter or eider ducks and we passed a number of islands where puffins, murres and razorbills nest by the thousands. Low growing flowers proliferate in the tundra during the short summer, and Dorothy had fun collecting and identifying them. 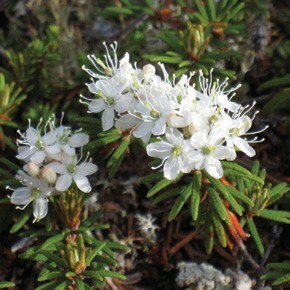 In almost every harbor we found white Labrador tea blossoms. Google says that tea made from the leaves is either poisonous or hallucinogenic. We didn’t try it. We had several breathtaking whale encounters. One minke followed Joyant for several miles. Minkes have white spots on the pectoral fins which you can see underwater, often allowing you to spot them before they surface. We also saw numerous humpbacks and had a mother and calf orca pair surface very close to Joyant’s stern. Over the years, Dorothy has developed two requirements for an A-rated harbor: 1) we are the only boat in the harbor, and 2) good walks ashore. Labrador satisfied the first criteria every night. Although we were with a few other boats when tied to docks in towns, we were the only boat in the harbor at every one of our overnight anchorages. As we moved north where tree thickets decreased and then disappeared entirely, the second criteria was usually satisfied. The tundra is soft and spongy, easy to walk on and provides good traction. We clambered to the top of numerous hills to get great views of the surrounding areas. On our cruise to southern Labrador 10 years ago, our favorite stop was Battle Harbour and we were pleased to find it still going strong 10 years later. In former days it was a bustling fishing center. Today it is a non-profit museum with guest lodging. Short hikes take you up to where you can view the bergs in the Strait of Belle Isle. On the highest hill is the antenna from which Peary broadcast to the world that he had reached the North Pole. Family-style dinners included local fish and berries. Since it can only be reached by private boat, Battle Harbour’s ferry, seaplane or helicopter, the other guests were intrepid and interesting. On our southbound stop, at a small church, we were privileged to attend a wedding of a young man who had been raised at Battle Harbour. One of our most dramatic anchorages ever was at the end of the North Arm of the Saglek Fiord in the Torngat Mountains National Park. 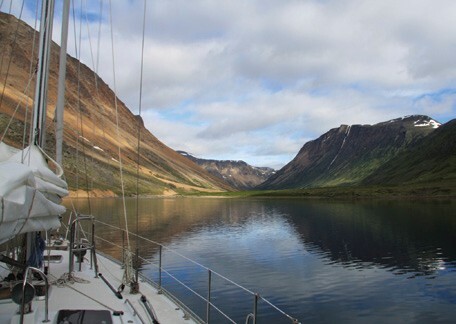 The desire for a sheltered harbor, favorable currents in both directions and sunny weather for excellent viewing, prompted us to attempt an anchorage at the end of the fiord. A stream flows into the inlet creating a shallow flat place. Actually, the word “shallow” is relative. We anchored in 55 feet of water, but there was very little wind and plenty of swinging room. Both evening and morning views of the high cliffs reflected in the water were a spectacular sight and photo-op for Tom. When the cod fishery was going strong in Labrador, the government built several villages for the fishermen which included sturdy docks. We tied to two of these which were still in good shape, and good ties, especially if you could arrange to be blown off. In both Smokey Tickle, north of Hamilton Inlet, and the Punchbowl to the south, the larger buildings had been dismantled and taken away, but the remains of many fishermen’s cabins and small boats were scattered around in various states of disrepair. We were in Labrador for just over five weeks. Weather in the high latitudes can become more difficult in the late summer, so we targeted a turnaround time of mid-July. Cape Chidley, which we reached July 18, was an anti-climax. The cape only gave us fog-shrouded views. That afternoon with a forecast of 15 to 20 knots, we had sustained periods of 30 knots and gusts to 45. We were happy to be headed south. On our way north, when stopped by the pack ice or dealing with shakedown issues. we questioned whether we would reach Chidley. 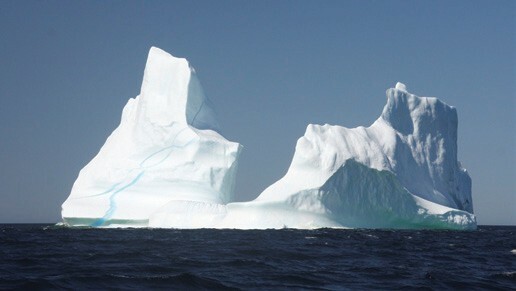 But we were glad we did and that we had a chance to see the dramatic and lonely northern reaches of Labrador. Editor’s note: This article was originally published in the 2014 edition of Voyages, the Cruising Club of America’s (CCA) annual publication, and is reprinted with permission. Special thanks to CCA Commodore Frederic T. Lhamon and Voyages Editors Dale and Doug Bruce. The Cruising Club of America is an international organization with a membership of 1,250 men and women who have voyaged the oceans for adventure and recreation. Their mission is “to promote cruising by amateurs, to encourage the development of suitable types of cruising craft, to stimulate interest in seamanship, navigation and handling of small vessels, and to gather and keep on file all information which may be of assistance to members in cruising.” The CCA organizes and runs the biennial Newport Bermuda Race and conducts safety at sea seminars. Their Bonnell Cove Foundation makes grants to non-profit organizations for projects in safety at sea and environmental protection. For more information, visit cruisingclub.org. Gimme something to write on!